Without warning, auto accidents may occur and leave people in San Antonio, Texas, with severe injuries. At the Chris Mayo Law Firm, our dedicated personal injury attorneys provide personalized guidance and representation to clients throughout Bexar County, including Bandera, Beeville, Boerne, Castroville, Devine, Floresville, Fredericksburg, Kerrville, Pearsall, Pleasanton, San Antonio, Schertz, Seguin, Texas City, Universal City and Uvalde. Since our law firm was founded, our attorneys have committed themselves to helping people who are injured as a result of the negligent or reckless actions of others to recover the maximum compensation for their economic and noneconomic losses. We have assisted clients with a range of complex personal injury matters, including those involving the following: truck and motorcycle accidents, slips and falls, premises liability, dangerous products, medical malpractice, nursing home abuse, head and spine injuries, oil rig accidents, Eagle Ford Shale injuries, dog bites and wrongful death. From mounting medical bills and wages lost as a result of time away from work, to permanent disability and psychological trauma, the effects of serious personal injuries can be devastating for individuals and their families. Striving to help our clients achieve financial justice, we offer personalized, honest counsel. We understand the physical, emotional and financial toll that mishaps and unexpected actions resulting in injuries can have, which is why we take a compassionate approach to each case we handle. 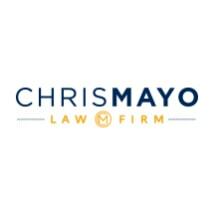 Beyond our work guiding people through personal injury-related matters, our attorneys at the Chris Mayo Law Firm also assist clients with Social Security Disability claims. Helping people complete the necessary paperwork and navigate the process, we strive to help our clients obtain the benefits they need and deserve. For the convenience of those we represent, we offer free initial consultations and we accept credit cards.